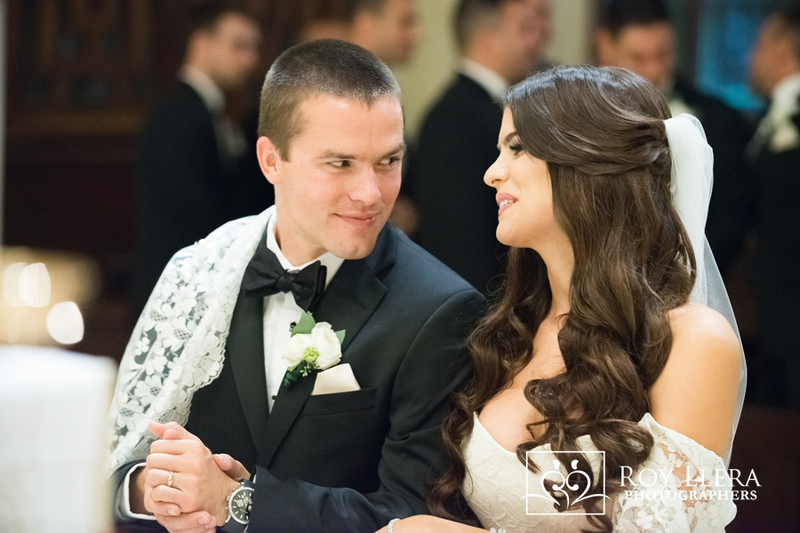 Home » A Magical Wedding for Monica and Vlad! perfect for a variety of beautiful portraits. Take a look; I’m sure that you’ll agree! 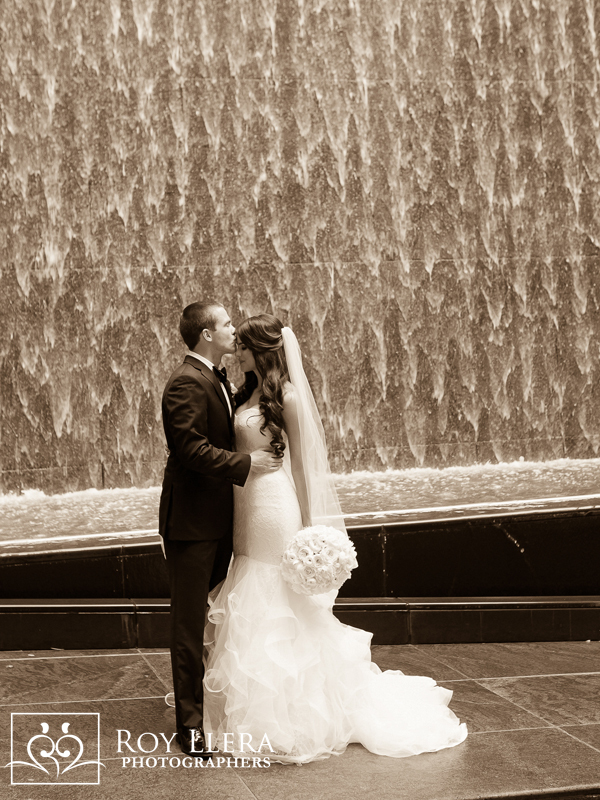 “One of the first vendors my husband and I selected was our photographer. 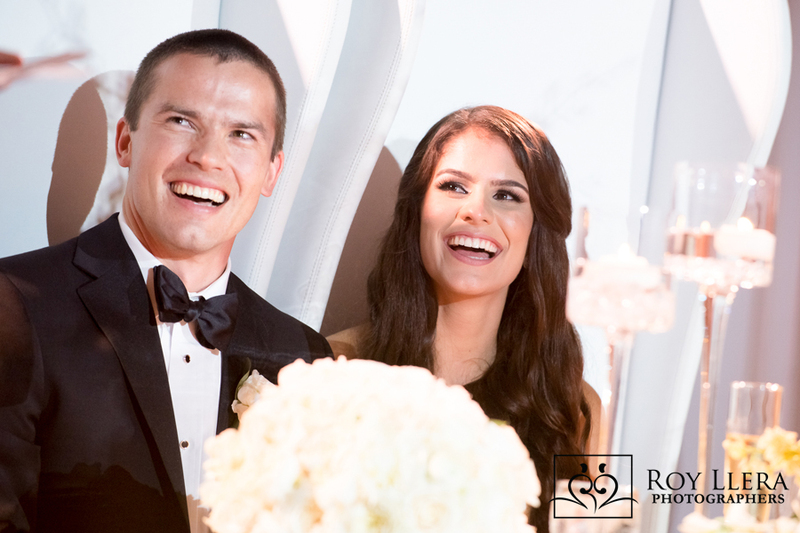 We were very thorough in our research and took into accounts so many different factors and we could not have been more thrilled with our decision to go with Roy. He was so informative when we met and really made us feel comfortable. It was a no-brainer to choose him. We decided to also have Roy photograph our rehearsal dinner. He went above and beyond for everything. He showed up at the church before the dinner just to meet everyone and get to know the dynamics and the who’s who. He did so much more than we asked of him and we are so grateful. When we received our pictures, my family, my friends, and myself, we were all so happy with the results. He captured so much excitement and emotion. Thank you for your kind and enthusiastic words, Monica! 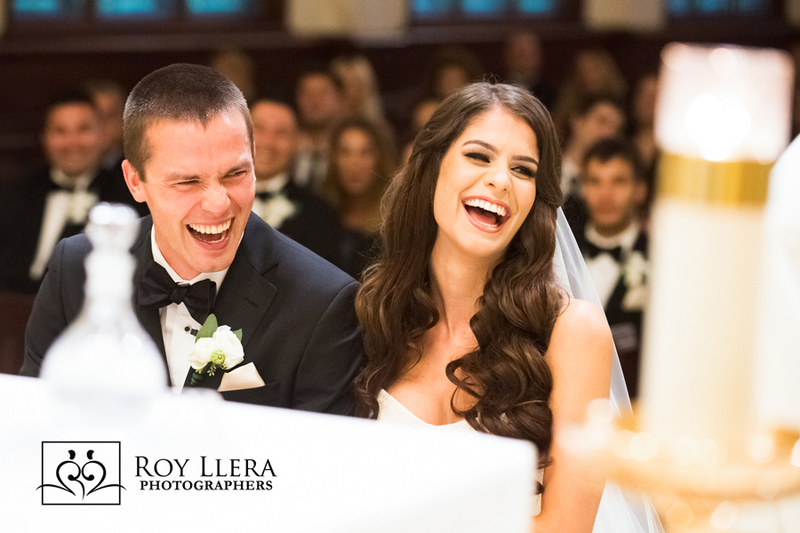 As a wedding photographer, there is nothing more important than making my clients happy! 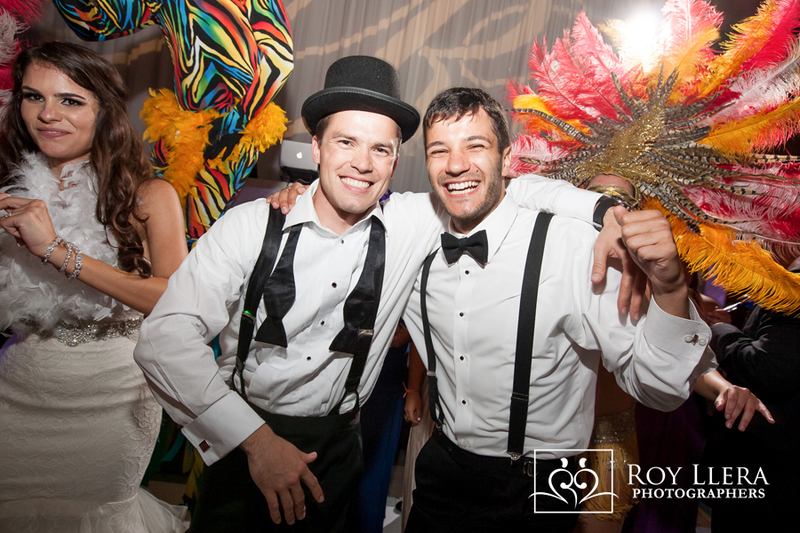 To be chosen to capture the many special moments is an honor and this Four Seasons Miami Wedding was full of moments that we so happily documented. So let me share with you a few gems from this magical life event! 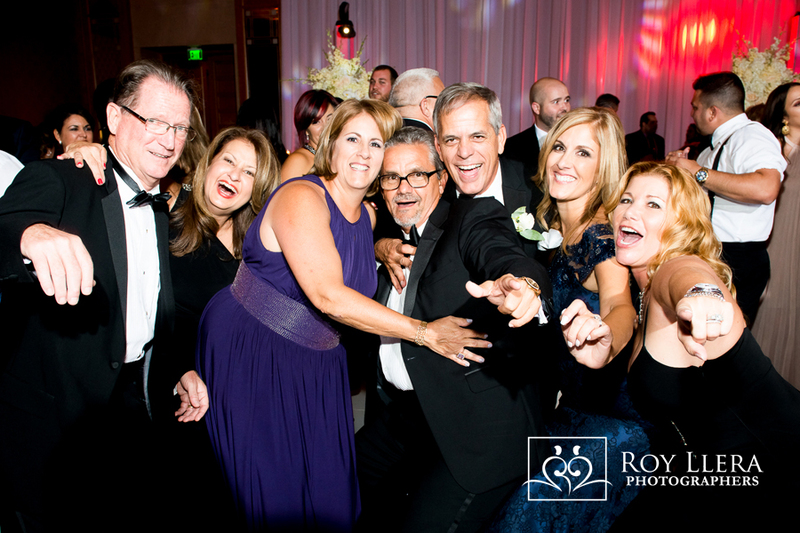 A favorite moment as a Miami wedding photographer is that moment when a newly wedded couple come down the aisle and share the looks, feelings, and expressions of just being married with family and friends! Now you don’t need to imagine the expression of joy and excitement when she received a gift from Vlad. 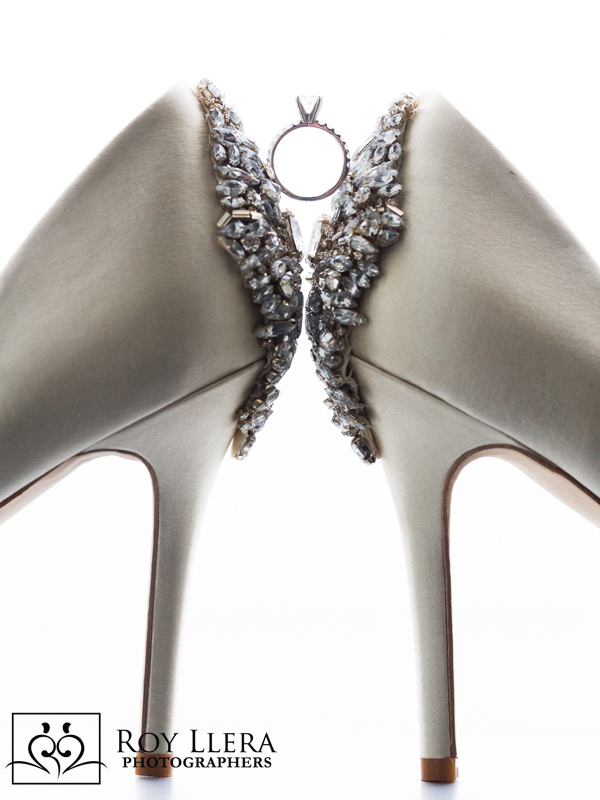 Brides love their shoes and their engagement ring. So I thought, why not combine the two? 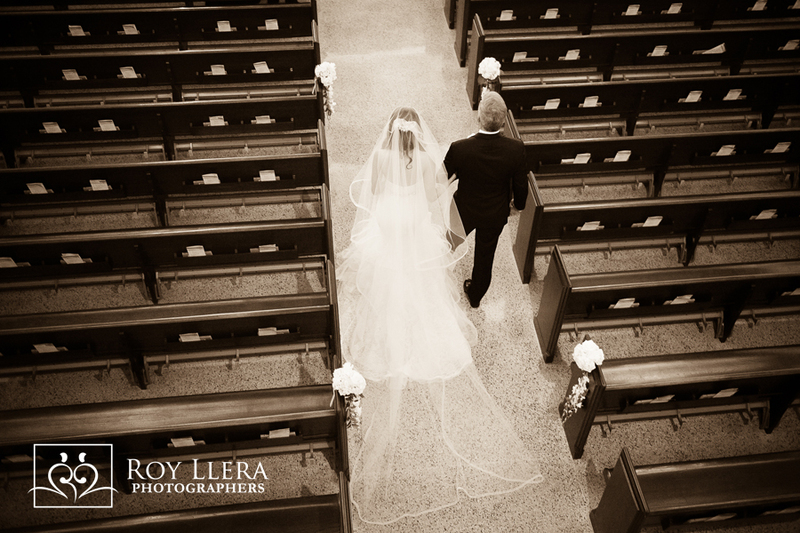 Here’s a view of Monica and Dad coming down the aisle. I always look for a balcony and this point of view! 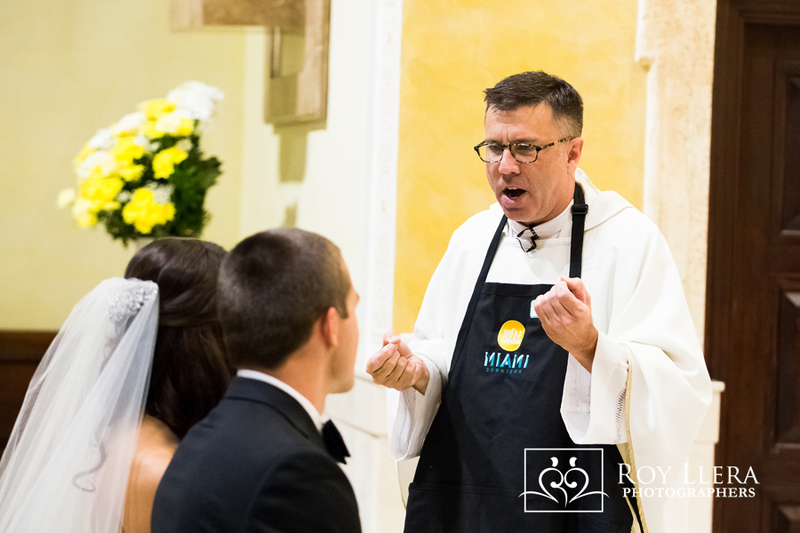 Now you may be wondering why the priest is wearing a Whole Foods Market apron. Vlad actually met and proposed to Monica at the very same cash register at the Coral Gables Whole Foods Market. It looks like the priest had a great sense of humor! Take a look at this video of Vlad’s proposal! I love the body language of hands and how they how they communicate and express the love that couples have for each other. 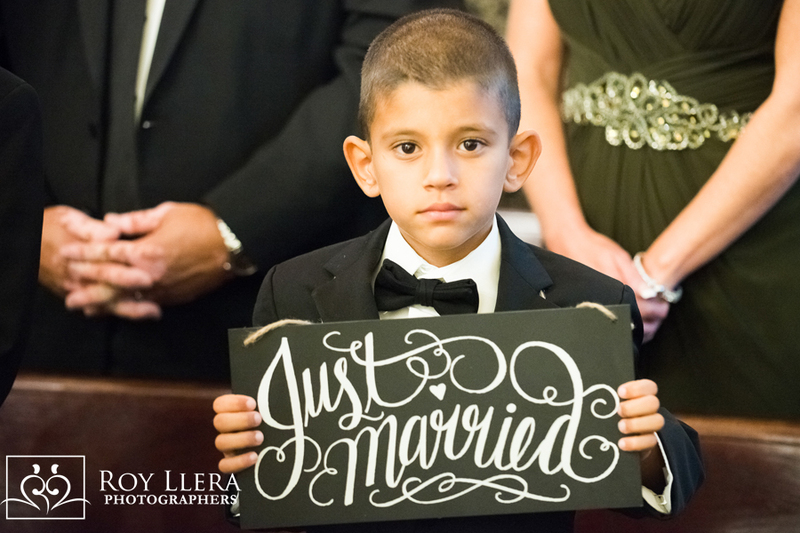 So many times I see couples of all ages and that subtle touch of a hand to convey love, warmth and that everything is OK.
A beautiful portrait of the ring bearer and a the perfect sign of the times! 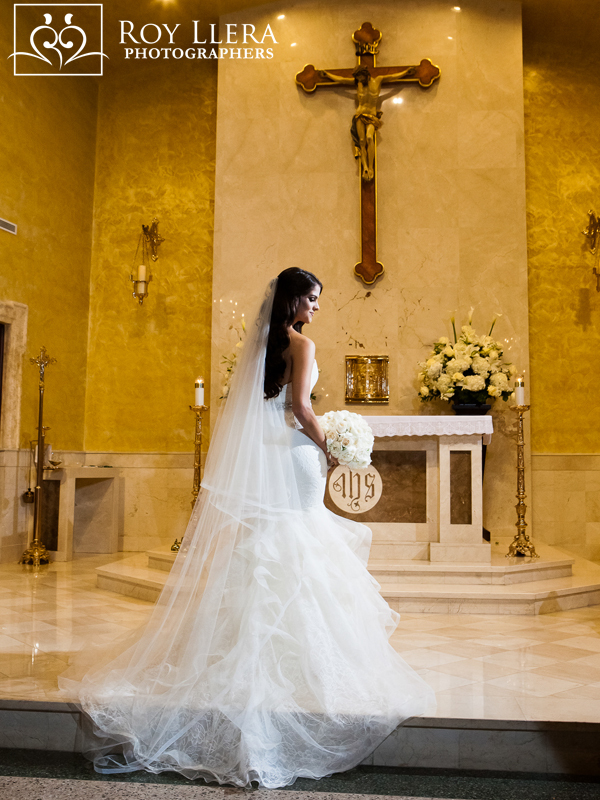 I am so thankful that with years (30+) of photographing weddings in Miami, I know how to anticipate and be in the right place at the right time. 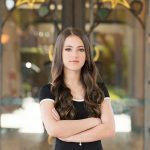 It’s integral to my success and beautiful photographs for you! As much as I enjoy capturing real moments, I also love creating timeless, classic portraits for generations to cherish forever. 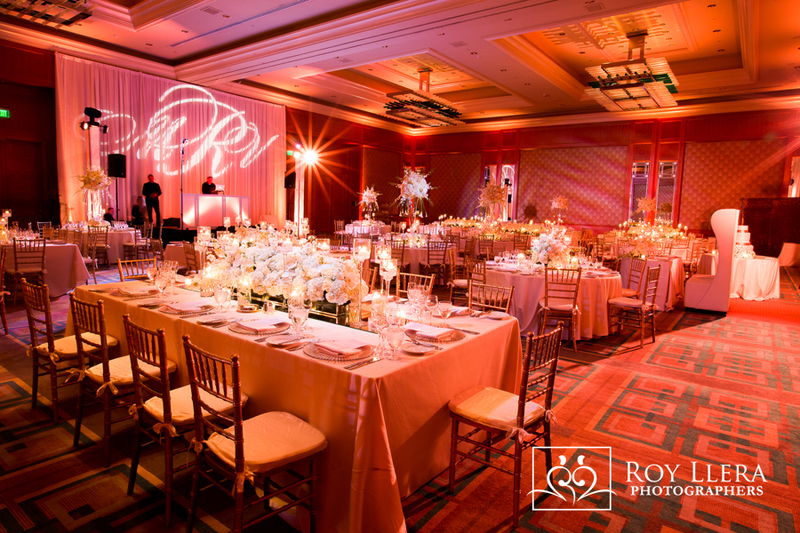 The value of an event planner cannot be expressed enough. 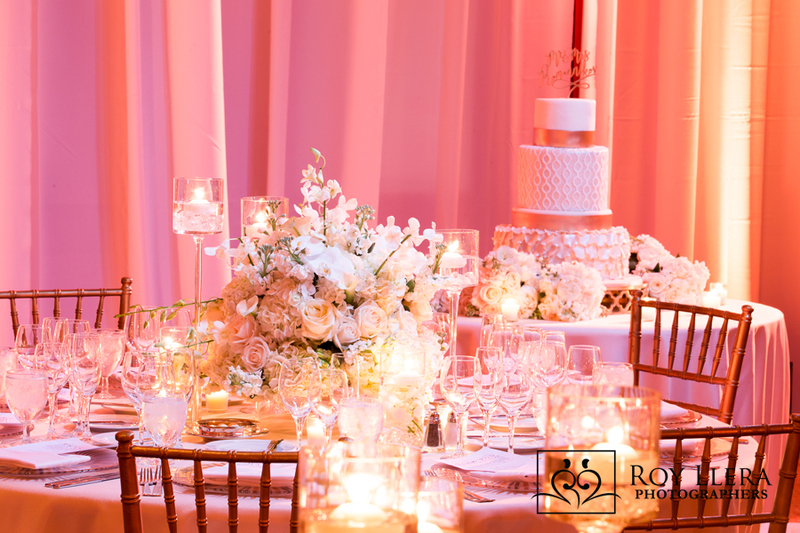 Eric Trelles of ET Events is one of the best! 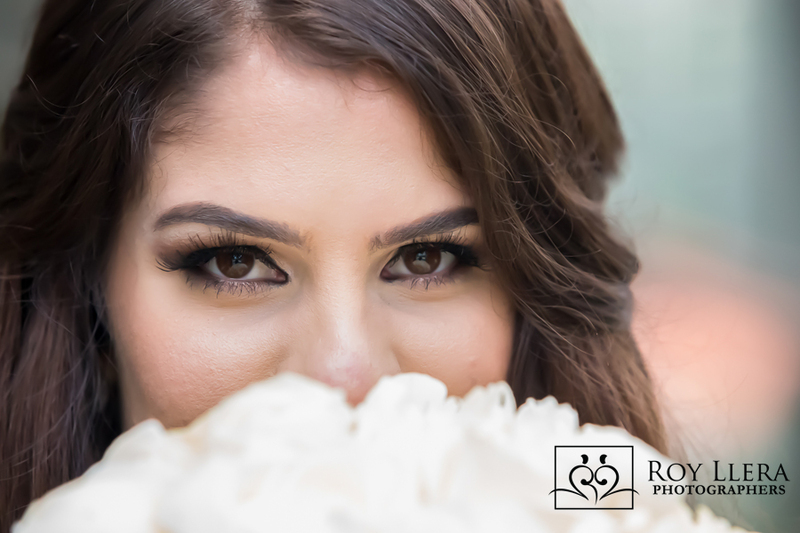 After a lovely ceremony at St Francis De Sales on Miami Beach, we had some time to kick back with Monica and Vlad to create some lovely portraits. 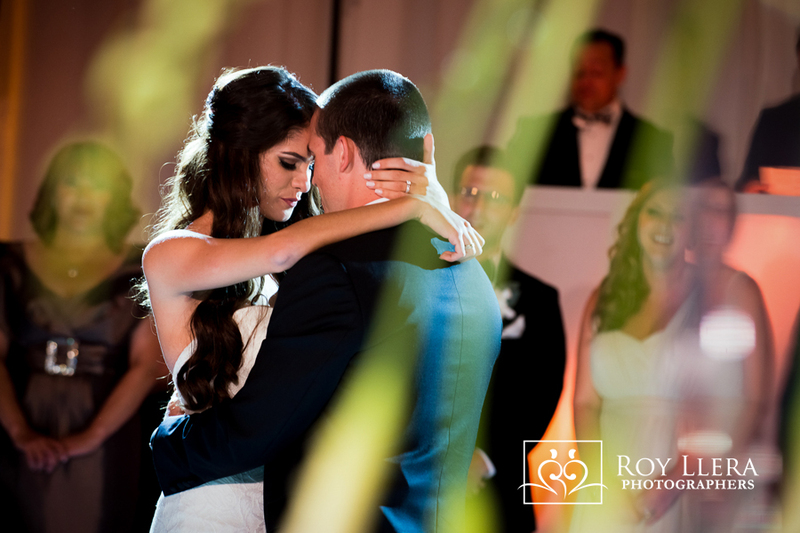 A Four Seasons Miami Wedding offers so much for creative and amazing images! I can only imagine what they’re thinking each time they look at each other with love and amazement in their eyes. I love shooting when they’re walking away. Here, I’ve told them we are good and let’s get ready for a party. But I am always looking for that subtle kiss and a moment shared not knowing that I am still capturing moments. 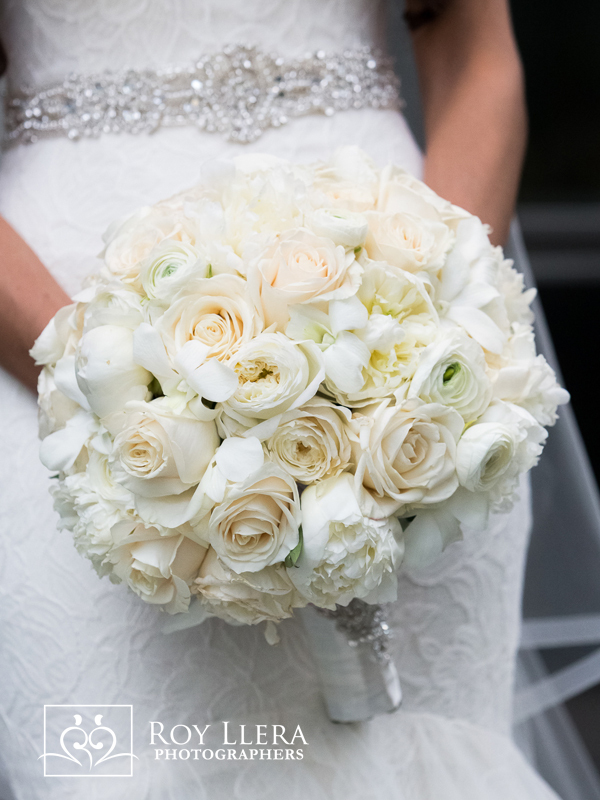 Here’s a stunning bouquet by Gil Sosa Design. One of my signature images, “The Eyes of Love”. While my team is out photographing the cocktail hour, I am delighted to capture all the eye candy that is in the ballroom! 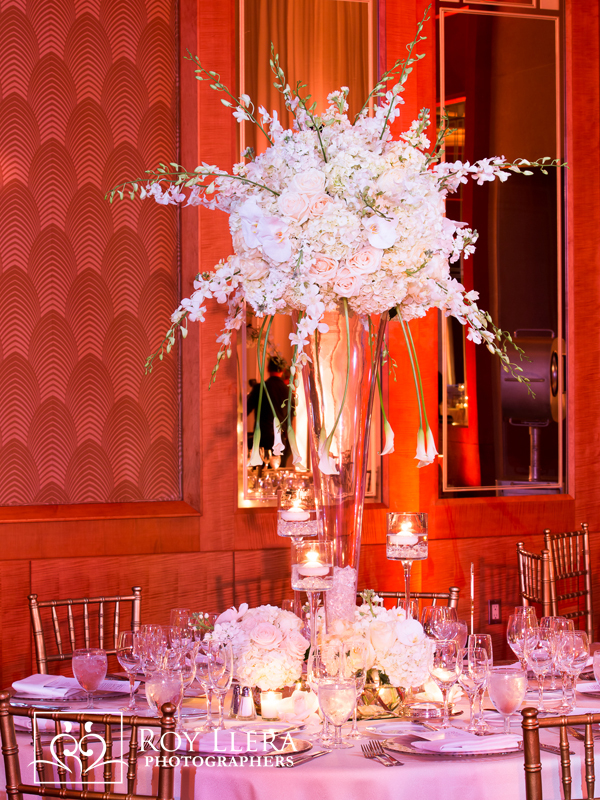 Here’s another stunning floral design by Gil Sosa Design! Getting the shots without being in the shot is important. 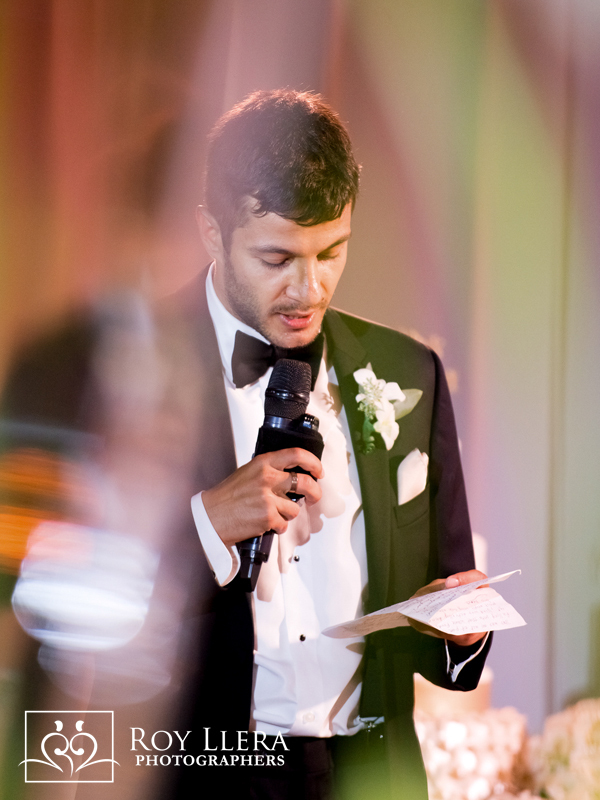 The best man’s toast obviously made for a fantastic reaction! 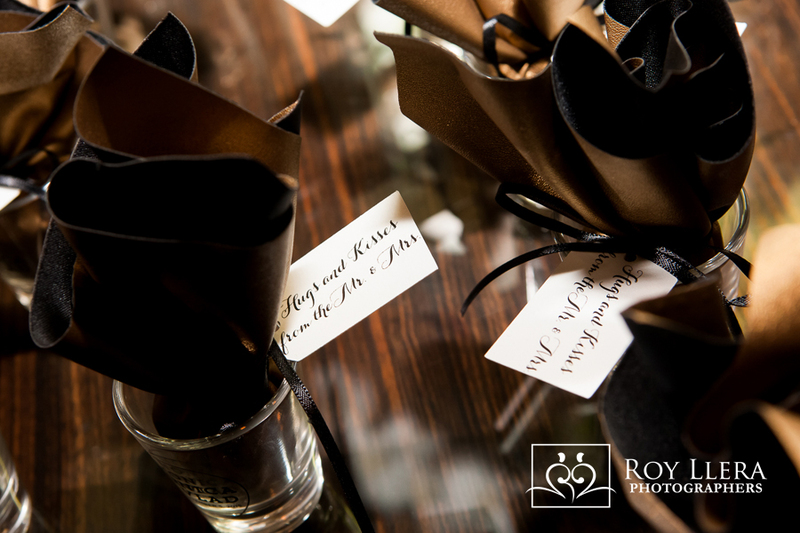 Images like these are so important as I believe every guest is special and I strive to make sure all in attendance are captured! 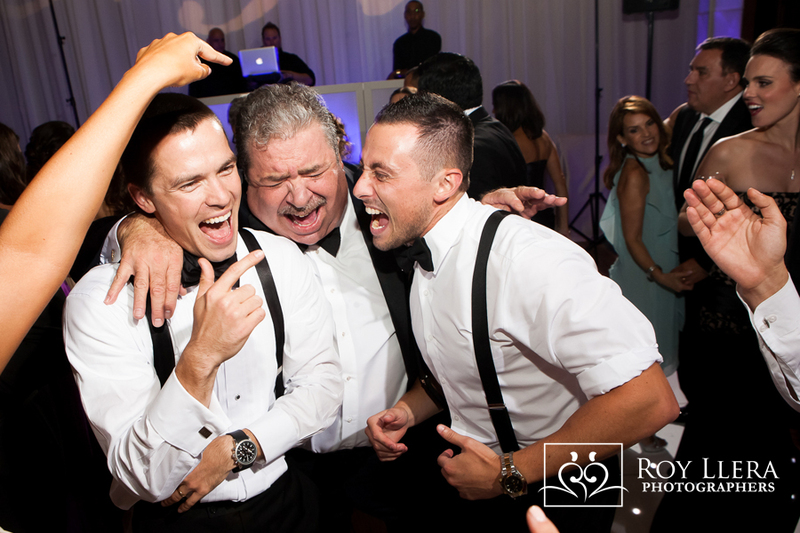 I love this moment with the Bride’s Godfather, Vlad, and one of his groomsmen! I don’t believe anything takes the party to another level of excitement and sheer revelry as this experience! 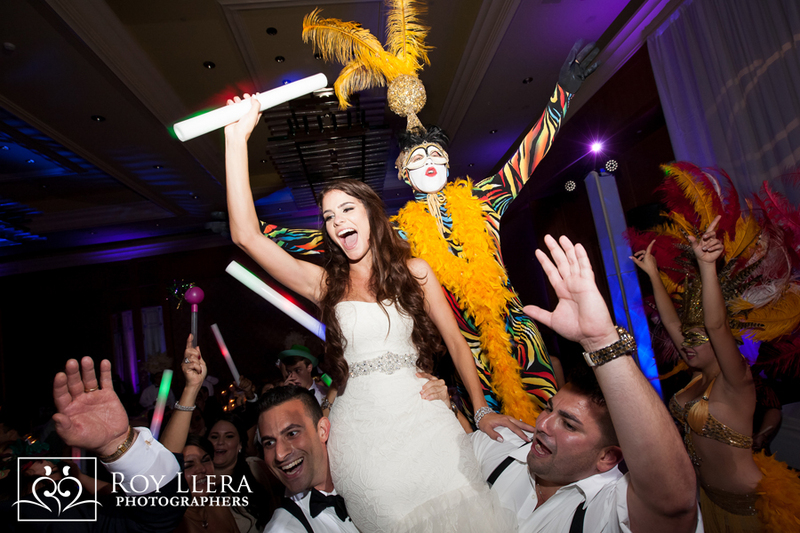 The dancers, drumming and crazy fun masks add so much color and excitement! 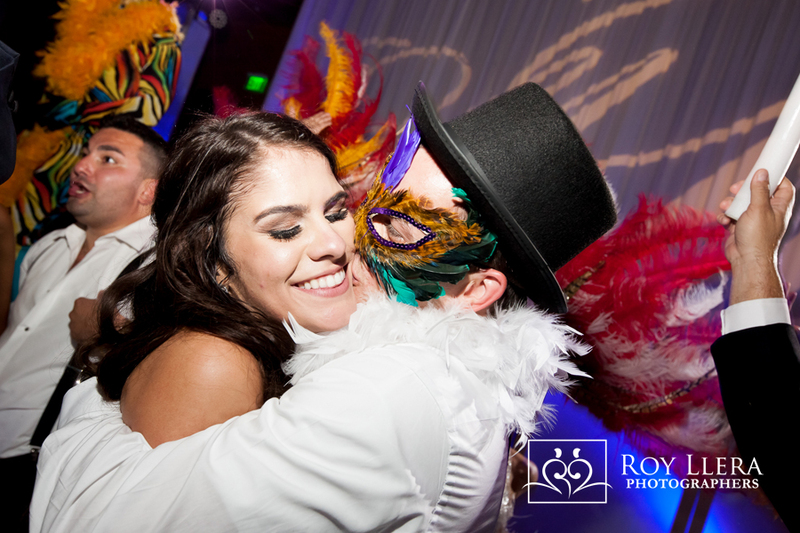 Of course, La Hora Loca means “The crazy hour”! 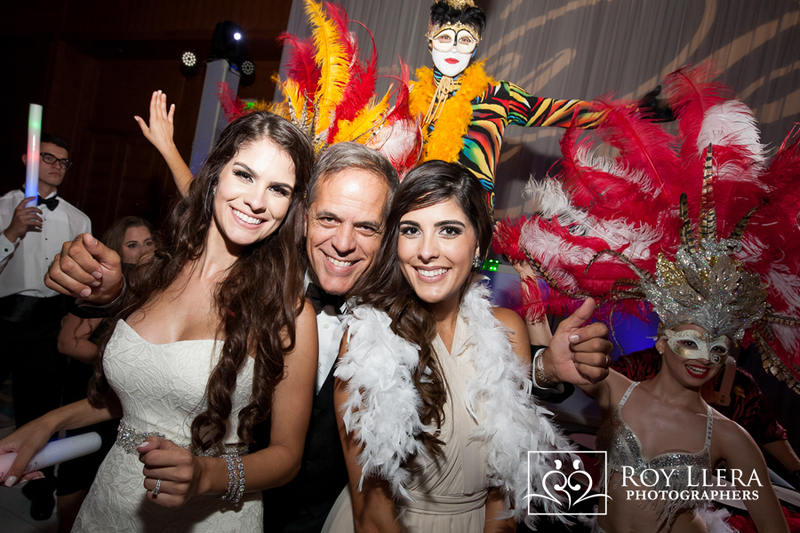 Dad and his girls are having such a great time! 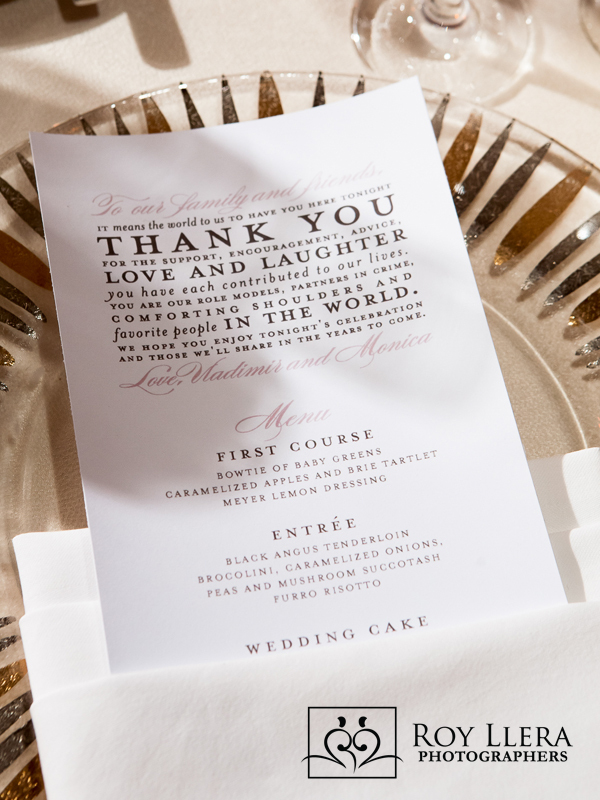 No wedding just happens and I would love to thank those creatives that made this event a success! 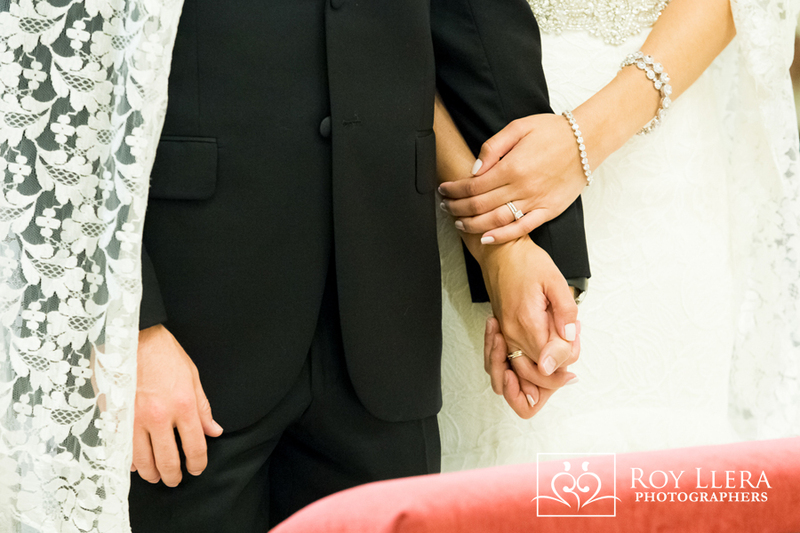 Monica and Vlad ~ Thank you for the wonderful wedding experience! 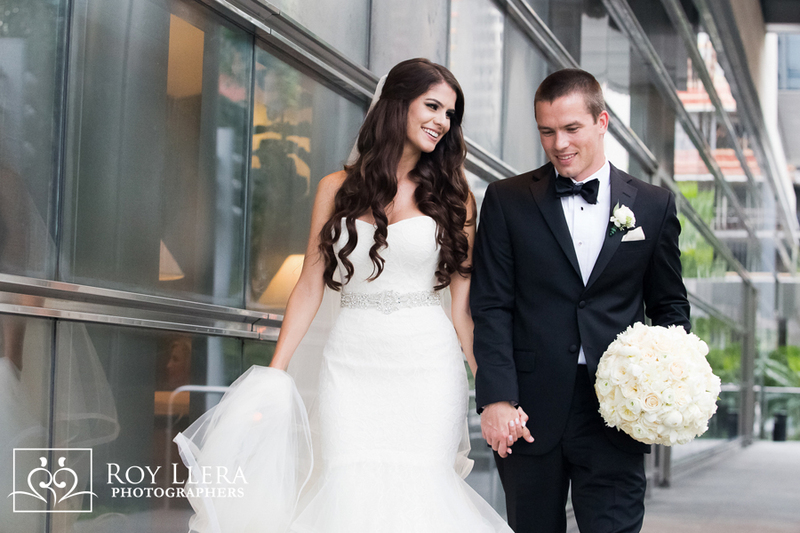 Would you like to have an incredible experience with your wedding photographer? Contact Me! 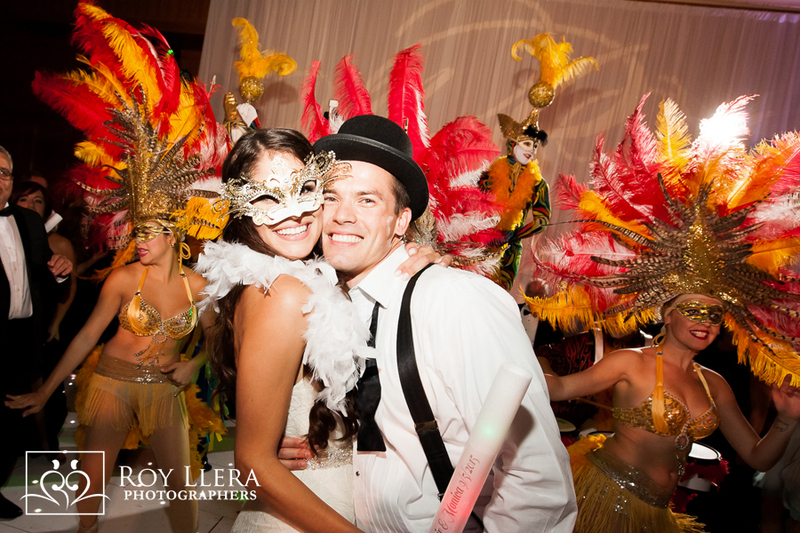 Black & Wine Events present with our Hora Loca show. 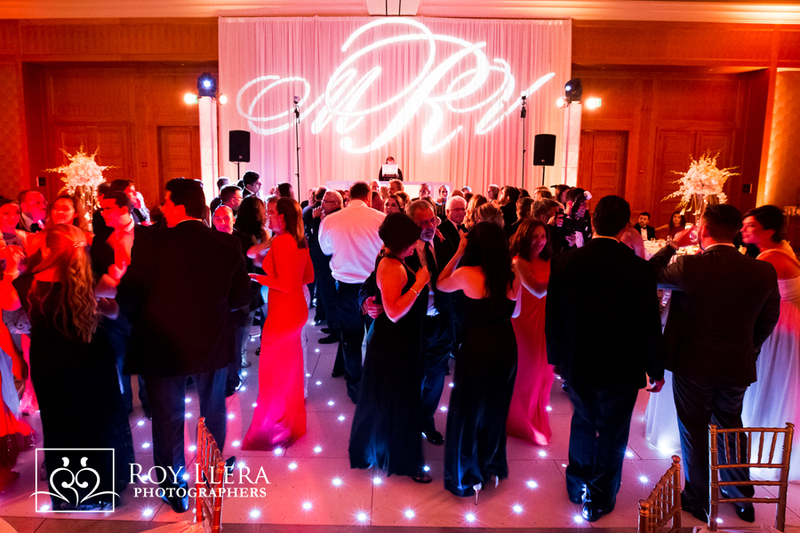 Very nice Job Roy Llera Photographer, Eric Trelles/Event plannig.